Magento Pro Configurable Product Grid Table View extension helps display all associated products in a neat and professional table with an ability to add as many products to cart at once. 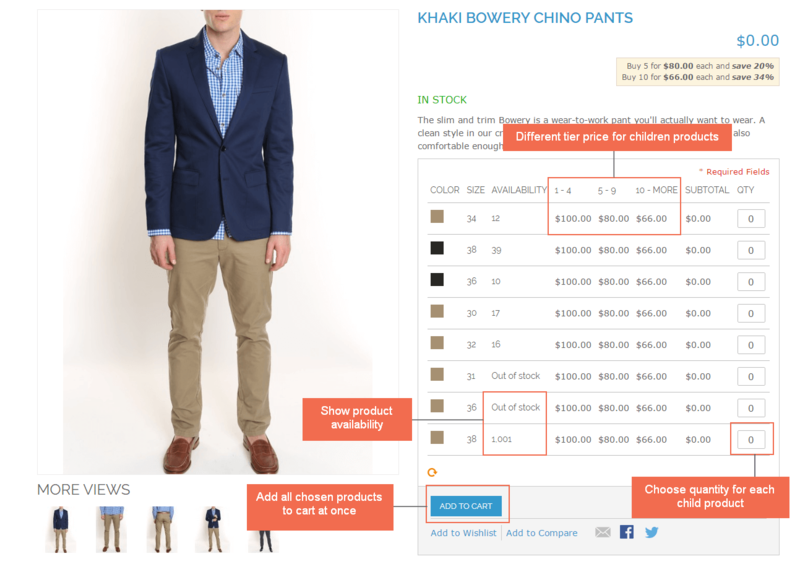 - For Magento 1 version: Configurable Product Table Ordering. - For Magento 2 version: Configurable Product Wholesale Display. Normally, the swatch default gets the image attached to label uploaded in configurable product edit page, meanwhile, this extension will take images uploaded for each child item. 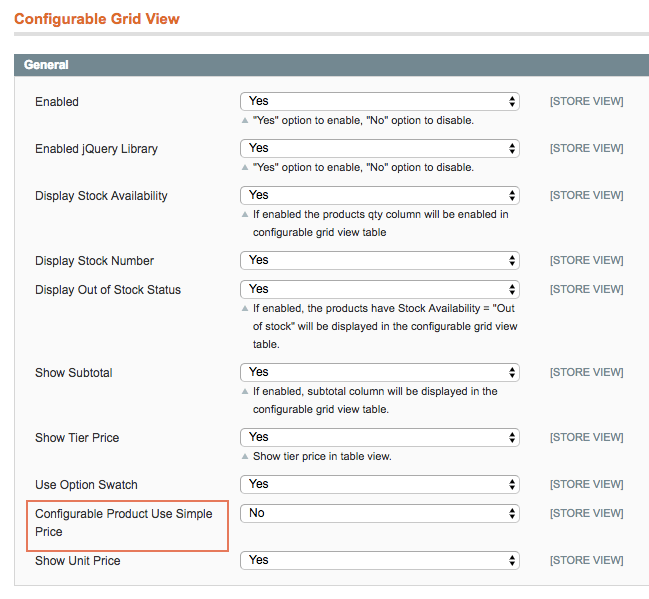 Why is Magento Pro Configurable Product Grid Table View extension your must-have extension? Magento Pro Configurable Grid Table View Extension allows setting different price and tier price for each simple product instead of configurable product. This helps online store owners to easily manage and change prices of simple products as their wish without depending on configurable product price. 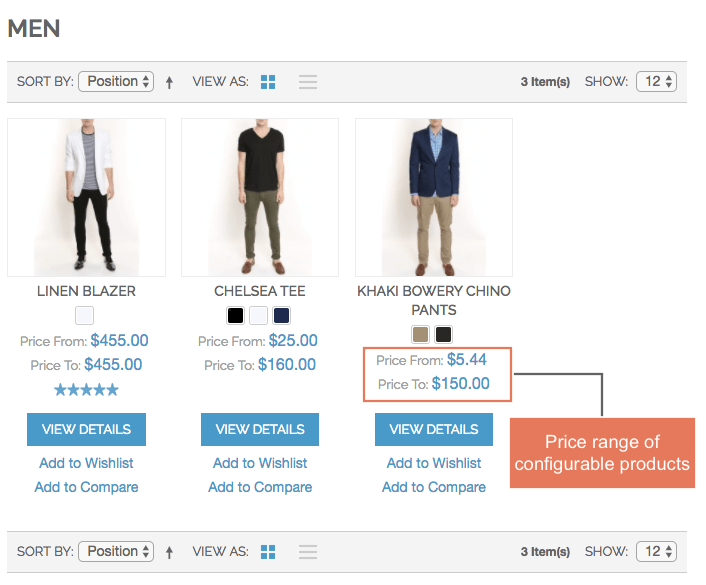 Magento Pro Configurable Product Table View extension intelligently chooses how to arrange your options in a grid table for example size by color and price. As a result, this extension enables you to show configurable products in a more visual and effective way in a table with the product name, product attributes, tier price, colors (with color swatch function built-in), availability and quantity of your products rather than displaying drop down boxes. The extension can display the simple associated products in a convenient table which makes it easy to manage. From back-end of this extension, you can plainly edit simple products and manage inventory within a configurable product in a very specific and easy-following table. This Magento extension also gives your customer an option to add more than one product configuration to the cart at one time, as well as allow customer self-control the quantity of wish-to-buy product. The extension effectively helps customers reduce much time to place repeated orders for the same or associated products. This naturally brings good customer experience in online purchase and also enhance sales effectiveness. This Magento module is fully compatible with existing simple products as well as configurable products. It generates simple associated products with selected attributes right on the configurable product page in Admin Panel. The extension works for configurable products with any number of attributes. Don't waste your time on manually creating all simple products one by one and then assigning them to a configurable product. With a few clicks, you can get this extension work on your online store for better speed performance. Magento Pro Configurable Product Grid Table view extension is developed by our certificated developers who ensure that it’s well-compatible with default Magento and hardly find any conflicts. This is a good extension. I had to correct problems that had arisen on my Magento and the support team was available, fast and efficient. Recommended. I really like this extension. No need to think twice when giving 5 stars for both quality and support service. This is a perfect solution for my problem. Thank you a lot for introducing it. "I have just installed this extension and it works great, i had 1 small question and the support was amazing, i then asked questions on cross compatibility with my theme and other extensions and again the support was spot on. Reason i chose this extension is the others had bad reviews or where unsupported"
You have made an outstanding product. Keep moving forward! Thanks for your wonderful product and cool service! Yeah! I'm totally satisfied with the quality and price of this extension! It's amazing, works well and help to improve my website to the new level! My customers also love it!!! !